Todd Joseph Miller (born June 4, 1981) is an American actor, stand-up comedian, producer and writer. In 2008, he made his acting debut in Cloverfield and from 2010 to 2014, he voiced Tuffnut Thorston in the first two How to Train Your Dragon films. From 2014 to 2017, he starred as Erlich Bachman in the HBO sitcom Silicon Valley and also played Marvel Comics character Weasel in 2016's Deadpool and its 2018 sequel, Deadpool 2. Miller also has had roles in films such as Yogi Bear, She's Out of My League, Transformers: Age of Extinction, Big Hero 6, Office Christmas Party, The Emoji Movie and Ready Player One. Miller was born in Denver, Colorado, the son of Leslie Miller, a clinical psychologist and Kent Miller, an attorney from Chanute, Kansas. His Christian father is of English, Scottish, German and Swedish ancestry, whereas his Jewish mother is of German-Jewish, Austrian-Jewish, and Russian-Jewish ancestry. He attended Graland Country Day School and graduated from Denver's East High School, where he participated in drama productions. His drama teacher at East High, Melody Duggan, confirms Miller was a "typical class clown", but said he was much more intuitive than the average teenager. "He understands the frailty of the human condition better than any kid I've ever had. In 2003, Miller graduated from George Washington University in Washington, D.C. with a B.A. in psychology with a concentration in situation theory and social influence. At GWU, he was a member of the comedy group receSs and the Lambda chapter of Phi Sigma Kappa fraternity. While in college, Miller studied the circus arts at Frichess Theatre Urbain in Paris, and attended the British American Drama Academy in London, where he studied Shakespeare for a summer. After college, Miller moved to Chicago and began to perform improvisation and stand-up comedy, performing with many local troupes. He toured with The Second City for two years. In 2008, he was named one of Variety's 10 Comics To Watch. In 2011, Miller released a comedy special, No Real Reason, and a comedy album, Mash Up Audiofile in 2012. In 2015, he was part of Funny or Die’s Oddball Comedy and Curiosity Festival, a touring show which included Amy Schumer, Aziz Ansari, and other comics. On June 17, 2017, HBO premiered his hour-long stand-up special, T.J. Miller: Meticulously Ridiculous, which was filmed in Miller's native Denver at the end of his 2016 Meticulously Ridiculous Tour. Miller appeared frequently as a member of the "round table" on Chelsea Lately. He appeared as Marmaduke Brooker in Carpoolers, which ran for 13 episodes on ABC in 2007–2008. In 2012, he voiced Robbie Valentino on the Disney channel cartoon Gravity Falls. On December 13, 2010, October 28, 2011, and June 14, 2012, he performed stand-up on Conan. On November 15, 2011, his stand-up special No Real Reason premiered on Comedy Central. In 2011, he hosted a special called Mash Up, which was picked up in 2012 for a full season by Comedy Central. He starred in the Fox TV series The Goodwin Games as Jimmy Goodwin. Miller starred in the HBO sitcom Silicon Valley, which has been met with widespread critical acclaim and he won the Critics' Choice Television Award for Best Supporting Actor in a Comedy Series in 2015. In May 2017, Miller and HBO jointly announced that Miller will not be returning for the 5th season of Silicon Valley. As a commercial actor, he voices a talking ball of mucus in commercials for Mucinex and stars as Greg the Genie in a promotional campaign for Slim Jim meat snacks. In Miller's film debut, Cloverfield, he appeared onscreen for only a few minutes, but his voice was heard in almost every scene as the character who videotaped most of the events depicted. In 2009, he played Cessna Jim in The Goods: Live Hard, Sell Hard and the dim-witted grindcore musician Rory in Mike Judge's comedy Extract. In 2010, he co-starred in She's Out of My League as Stainer, played Brian the Concierge in Get Him to the Greek and appeared in a supporting role in the film Unstoppable. He voiced the character ‘Tuffnut’ in the Oscar-nominated animated films How to Train Your Dragon and How to Train Your Dragon 2. He also played Dan in Gulliver's Travels, released in December 2010. He played the supporting character of Ranger Jones in the live-action/animated Yogi Bear 2010 film. Unlike his character on the cartoon show, he is "dumb-but-not-in-a-funny-way", according to the Buffalo News. He was cast in the part after two auditions; as a joke, he sent Warner Bros. an improvised video audition with an actual bear, though he had already been offered the part before they received it. In 2011, he appeared in the film Our Idiot Brother. He had a cameo as administrative personnel for Rolling Stone in the 2012 film Rock of Ages. He starred in the 2016 movie Search Party alongside Adam Pally. In 2014, he appeared in Transformers: Age of Extinction. In November 2014, he was the voice of Fred in the superhero CGI film Big Hero 6. He also played Weasel in Deadpool and Deadpool 2. In 2017, he portrayed the voice of the main protagonist Gene, a meh emoji with abnormal expressions, in the animated The Emoji Movie which got extremely negative reception. On September 12, 2011, Miller released a comedy rap concept album titled The Extended Play E.P. The album features comedians Bo Burnham, Doug Benson, Pete Holmes and hip-hop artists Ugly Duckling and Johnny Polygon. In 2012, Miller released The Extended Play E.P. Illegal Art Remix Tape. Also in 2012, Miller released Mash Up Audiofile on Comedy Central Records to mixed reviews. Miller started appearing on Chicago-based comedy Podcast Red Bar Radio in 2006 as a semi-regular co-host. He hosts a podcast with friend and fellow comedian Cash Levy, titled Cashing in With TJ Miller, which began airing in March 2012 on the Nerdist Network. He is also a frequent guest on Doug Benson's podcast Doug Loves Movies. In 2014, Miller became engaged to his longtime girlfriend, actress and mixed-media artist Kate Gorney, who changed her last name to Miller. They were married at the Denver Botanic Gardens on September 6, 2015. Miller described learning about an undiagnosed cerebral arteriovenous malformation on his right frontal lobe on the Pete Holmes podcast You Made It Weird on October 28, 2011. He stated that he became more philosophical, narrated his behaviors, and was unable to sleep while filming Yogi Bear in New Zealand in 2010. His brain surgery was successful, though there was a 10 percent risk of fatality. On December 9, 2016, Miller was arrested and jailed in Los Angeles for allegedly assaulting a driver of the Uber car service company because of a debate he had with the driver over Donald Trump, of whom Miller is an outspoken critic. He was released on his own recognizance after bail was set at $20,000. In March 2018, Miller reached a civil settlement with the Uber driver. In late 2017, allegations against Miller from his time in college in 2001 resurfaced, part of the Me Too movement and Weinstein effect. An anonymous woman who attended George Washington University with Miller and his wife Kate told The Daily Beast reporter Asawin Suebsaeng that Miller (her then-boyfriend) became violent with her during a sexual encounter; he allegedly choked, shook, and punched her in the mouth, all without her consent. Suebsaeng attempted to contact witnesses and other people involved with the case, some of whom corroborated the accuser's story, adding that it was brought to the attention of the college at the time. Student conduct proceedings were held, the results of which are sealed, although Suebsaeng wrote that (unnamed) "knowledgeable sources" had said that, despite Miller having already graduated by that time, he was declared to be "expelled" at the conclusion of the proceedings. The Millers responded to the allegations, characterizing the accuser as a vindictive former colleague in a campus comedy troupe who was asked to leave due to inappropriate behavior. The statement said that "[s]adly she is now using the current climate to bandwagon and launch these false accusations again", and also stated that her accusation "undermines the important movement to make women feel safe coming forward about legitimate claims against real known predators". Miller was arrested on the night of April 9, 2018 at LaGuardia Airport in Queens, New York on federal charges related to a fake bomb threat made while aboard an Amtrak train. According to a Department of Justice press release, he placed an emergency call on March 18, 2018, and reported that a female passenger had "a bomb in her bag" while traveling on Amtrak Train 2256 from Washington, D.C., toward Penn Station in New York City. After authorities evacuated passengers and searched Amtrak Train 2256, it turned out that Miller was actually on Amtrak Train 2258, which was also evacuated of passengers and searched. No evidence of any explosive device or materials was detected after officials stopped and inspected both trains. According to witnesses interviewed by Amtrak investigators, he appeared to be heavily intoxicated and involved, "in hostile exchanges with a woman who was sitting in a different row from him in the first-class car", and that he had been removed from the train prior to his intended stop due to his intoxication. On April 10, 2018, he was released on a $100,000 bond following an appearance at a federal court hearing in New Haven, Connecticut. If convicted, he could face up to five years in prison. In September 2018, it was reported that Miller was negotiating a plea deal to avoid a trial. As a result of this and the sexual assault allegations, Dreamworks removed Miller from How to Train Your Dragon: The Hidden World. On August 5, 2017, Miller sent to his former friend, film-critic Danielle Solzman, a lengthy e-mail using transphobic slurs against her after she asked him to remove a derogatory word that was on his official website. On July 18, 2018, actress Alice Wetterlund, who recurred on Silicon Valley, a show in which Miller starred, took to Twitter to accuse Miller of inappropriate, unprofessional behavior on set, writing, "I hope to not ruin it for you, but TJ Miller was a bully and petulant brat." In response to her post, HBO, the network that produces the series, released a statement declaring that, "While this is the first time we have heard Alice Wetterlund comment on her experiences on 'Silicon Valley', we are disappointed to learn of her concerns. HBO and the producers have always taken very seriously our responsibility to create a welcoming and congenial environment for everyone who works on the show." 2011 Traffic Light Jason Episode: "Breaking Bread"
2011 Happy Endings Jason Shershow Episode: "The Shershow Redemption"
2011 The League Gabriel Episode: "The Light of Genesis"
2011 Fact Checkers Unit Cop Episode: "Excessive Gass"
2012 Romantic Encounters Toy Story 5 Episode: "Toy Story 5"
2015 Family Guy Premature Volcano (voice) Episode: "Roasted Guy"
2016 Lip Sync Battle Himself Episode: "Sam Richardson vs. T.J. Miller"
^ Ryzik, Melena (April 20, 2016). "Q. and A. With T.J. Miller: 'Silicon Valley' and the Mucinex Phlegm Ball". The New York Times. ^ Marantz, Andrew (June 9, 2016). "How 'Silicon Valley' Nails Silicon Valley". The New Yorker. ^ Wenzel, John (August 23, 2017). "T.J. Miller on leaving Silicon Valley, his summer of controversy, and losing his mind: "I was stunting"". The Denver Post. ^ a b c d Husted, Bill (December 11, 2010). "Husted: 2010 is Miller time for Denver kid who made it big". The Denver Post. ^ a b c Blair, Elizabeth (February 13, 2016). "Comic T.J. Miller: Trained Clown And Student Of Nietzsche" (Includes audio). Weekend Edition Saturday. NPR. ^ QHD (August 4, 2016). "T J Miller [Unknown? Facts] - Hosts podcast "Cashing in ..." Retrieved December 12, 2016 – via YouTube. ^ "Jewish comedian T.J. Miller arrested in altercation over Trump with Uber driver - Jewish Telegraphic Agency". www.jta.org. Retrieved 10 April 2018. ^ "Jewish comedian arrested for Uber fight over Trump". Retrieved 10 April 2018. ^ Kabas, Marisa (October 1, 2007). "GW alum stars in ABC's new primetime show". The GW Hatchet. ^ Anderson, Devin (October 8, 2014). "Real Talk with TJ Miller". The Ferris State Torch. Ferris State University. ^ a b "Performers: T.J. Miller". The Groundlings. Retrieved September 6, 2017. ^ Heidemann, Jason (1 April 2015). "Silicon Valley Star T.J. Miller Says Nietzsche Made Him Funny". Chicago. ^ Campus Activities Magazine (3 December 2007). "TJ Miller". Second Thoughts from The Second City. ^ @iowastatedaily.com, Emily.Urban. "TJ Miller to perform in the Great Hall". Iowa State Daily. Retrieved 2017-10-11. ^ Frankel, Daniel (July 10, 2008). "T.J. Miller: 10 Comics to Watch". Variety. ^ "T.J. Miller's "No Real Reason" keeps it weird, keeps it great". The Laugh Button. November 16, 2011. ^ Heisler, Steve (December 10, 2012). "The best comedy albums of 2012". The A.V. Club. ^ a b c Niccum, Jon (August 26, 2015). "Comic actor T.J. Miller: An oddball among oddballs". The Kansas City Star. ^ Petski, Denise (April 10, 2017). "HBO Sets Summer Premiere For Stand-Up Special From Silicon Valley's T.J. Miller". Deadline Hollywood. ^ Andreeva, Nellie (17 February 2012). "Comedy Central Greenlights Stand-Up Series Hosted By T.J. Miller". Deadline Hollywood. ^ Heisler, Steve (11 March 2011). "Mash Up". The A.V. Club. ^ Andreeva, Nellie (June 7, 2012). "T.J. Miller To Play Lead On New Fox Comedy Series 'Goodwin Games' In Recasting". Deadline Hollywood. Retrieved October 8, 2017. ^ Otterson, Joe (May 25, 2017). "T.J. Miller to Exit 'Silicon Valley' Ahead of Season 5". Variety. ^ Sandberg, Bryn Elise (June 25, 2017). "T.J. Miller Says Leaving 'Silicon Valley' "Felt Like a Breakup"". The Hollywood Reporter. ^ a b Marchese, David (July 23, 2017). "'People Need a Villain' - T.J. Miller Knows You Think He's Crazy for Leaving Silicon Valley". Vulture. ^ Husband, Andrew (30 September 2015). "T.J. Miller Tells Us Why He Thinks Making Funny Commercials Is Better Than Being On 'SNL'". Uproxx. ^ Chang, Justin (December 13, 2010). "Review: 'Yogi Bear'". Variety. ^ Miller, Melinda (December 16, 2010). "Spoiling the fun; Film with potential winds up being mostly unbearable". The Buffalo News. ^ "T.J. Miller Auditions for Yogi the Bear" (Video). JordanVogtRoberts. October 28, 2009. ^ Kit, Borys (April 23, 2013). "'Search Party' Finds Its Stars, Begins Shooting Next Week". The Hollywood Reporter. ^ Kit, Borys (May 28, 2013). "T.J. Miller Joins 'Transformers 4'". The Hollywood Reporter. ^ a b Snierson, Dan (17 July 2016). "'Silicon Valley' star T.J. Miller to voice lead character in emoji movie". Entertainment Weekly. ^ Jeffries, David (September 25, 2011). "The Extended Play EP - T.J. Miller". AllMusic. ^ Coplanon, Chris (September 19, 2012). "Stream: T.J. Miller – The Extended Play E.P. Illegal Art ReMixTape (CoS Premiere)". Consequence of Sound. ^ Seabaugh, Julie (November 12, 2012). "T.J. Miller Mash Up Audiofile album review". The Spit Take. ^ "Cashing In with T.J. Miller". Nerdist. ^ "Doug Loves Movies". A Special Thing Records. ^ Sykes, Logan (December 9, 2016). "You've Never Seen Anything Like This Whimsical Art Deco-Inspired Wedding". Town & Country. ^ Harwood, Erika (August 17, 2017). "Kate Miller, Artist and Wife of T.J., Is O.K. Being Misunderstood". Vanity Fair. ^ Holmes, Pete; Miller, T.J. (28 October 2011). "You Made It Weird #2: TJ Miller" (Podcast). Nerdist. ^ Yee, Yip Wai. "8 Questions with: Silicon Valley star and real-life geek Thomas Middleditch." The Straits Times. N.p., 13 May 2016. Web. 20 July 2017. ^ Stone, Natalie (9 December 2016). "Silicon Valley's T.J. Miller Arrested on Suspicion of Battery on Car Service Driver". People. ^ Dobuzinskis, Alex (9 December 2016). "Actor T.J. Miller arrested after altercation with Uber driver". Reuters. ^ "T.J. Miller settles with Uber driver". Page Six. 2018-03-14. Retrieved 2018-09-05. ^ "T.J. Miller and wife deny sexual assault allegations against him". 19 December 2017. Retrieved 10 April 2018. ^ Suebsaeng, Asawin (December 19, 2017). "'Silicon Valley' Star T.J. Miller Accused of Sexually Assaulting and Punching a Woman". The Daily Beast. Retrieved January 2, 2018. ^ Birnbaum, Debra (December 19, 2017). "T.J. Miller Denies Sexual Assault Allegation". Variety. Retrieved January 2, 2018. ^ CNN, Lisa Respers France,. "T.J. Miller arrested for alleged fake bomb threat". Retrieved 10 April 2018. ^ "New York Man Charged with Calling in False Bomb Threat from Amtrak Train". www.justice.gov. Retrieved 10 April 2018. ^ Petski, Denise (10 April 2018). "T.J. Miller Charged With Calling In Fake Bomb Threat". Retrieved 10 April 2018. ^ Khatchatourian, Maane (April 10, 2018). "T.J. Miller Arrested for Allegedly Reporting False Bomb Threat". Variety. Retrieved April 10, 2018. ^ "T.J. Miller negotiating plea deal over alleged fake bomb threat". Page Six. 2018-09-04. Retrieved 2018-09-05. ^ Renfro, Kim. "'How to Train Your Dragon: The Hidden World' director says T.J. Miller's removal from the movie wasn't his decision: 'I didn't have a lot of say in the matter'". Insider.com. Retrieved 25 February 2019. ^ Wright, Tolly (December 19, 2017). "T.J. Miller reportedly Sent Transphobic Email to Critic". Vulture. ^ bradmin (27 March 2014). "Disney's 'Big Hero 6' First Casting Announcement is Literally a Monster". Stitch Kingdom. 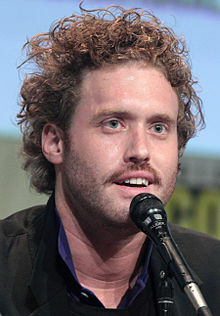 Wikimedia Commons has media related to T.J. Miller.